Love everything Nicholson and Sackville West. Have you read Portrait of A Marriage? It is such a beautiful telling of an unusual but loving relationship. 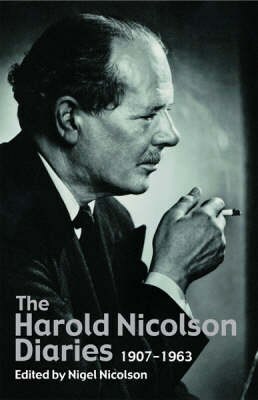 I read Portrait of a Marriage years and years ago when I was in my early teens but really want to read it again, now that I know more about both Nicolson and Sackville-West. It is on my list for A Century of Books in 2014. As you say, being a reader I mostly think of him as Vita’s husband, although of course I am aware of him as a diplomat. I love journals and so I’m adding this to the list of those I keep in stock for times when I need books I can easily pick up and put down again. Thanks for the introduction. I’ve still never read anything by Sackville-West but at least now I have some idea of who she is, which I certainly didn’t when I was younger and was first introduced to Nicolson. If you love diaries, this is well worth checking out! It is wonderful! I hope you’re able to track down a copy. I just recently came to know a bit about Harold Nicolson, from Anne Morrow Lindbergh’s diaries, when they were living in England and renting their house in Kent. I’ve loved the letters you’ve posted (and linked to above), and I’d like to read this. There is a good selection of entries from the time Nicolson spent with the Lindberghs so I am sure those would be an interest compliment to Lingbergh’s diaries. This does sound interesting I loved Portrait of a marriage. If you’ve already read Portrait of a Marriage this is a really interesting complement to it. Resistance is futile! I hope you enjoy these as much as I did. Sorry you didn’t enjoy these, Silvia. I haven’t read the 3 volume collection but I think the 2004 single-volume I read is a really great edition.